In the mid 1990's I was living in Dallas and was leaving to go home to Louisiana for a visit during a particularly blustery and cold winter. I stopped to fill up my gas tank at a station just down the street from my house. While there, a Hari Krishna man handed me a carnation through my car window and wanted to discuss his religion with me. I politely declined but he gave me the flower anyway. I set it on the passenger seat with the intention of throwing it away at my next fill-up in North Louisiana. I forgot. I drove with that flower in the car next to me for the next 7-1/2 hours until I arrived at my mother's house. Unbeknownst to me, that Hari Krishna had the flu! Thirty-six hours later I was.....sick....as....a....dog. Ugggghhhh. Fortunately, my mother had dinner at a friend's previously in the week, in which the friend served a wonderful Homemade Vegetable Beef Soup. Mom called her friend, got the recipe and made it for me. Oh My Gosh, it was divine! It warmed me up, soothed my sore throat, helped clear my stuffy head and was hearty enough to fill me up for awhile, gave me a little energy and was very comforting. It was the best vegetable beef soup I ever had. Upon my return to Dallas, when I finally felt up to it, I called Mom and got the recipe. I've been making this soup ever since....winter, spring, summer or fall...doesn't matter, I love it anytime of the year and all the time! The quantity of this recipe is very large so I like to put half of it up in the freezer for later use. To make this recipe you will need a large soup pot. Place all above ingredients in a large soup pot and fill pot with water to cover 3" over, stir, bring to a boil then reduce heat to a simmer. Allow to cook down thoroughly, approximately two and a half hours, stirring occassionally. Cook for another 2 hours or until vegetables are cooked and tender. Recheck seasonings and serve with buttered and toasted french bread. 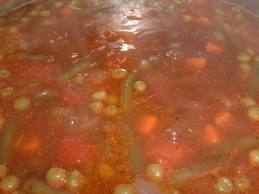 ****The secret to any good soup, especially this one, is to slowly simmer it for hours. I start it early in the afternoon so it's ready by dinner or cook it on the weekend for the next week. like yours. Ιt's pretty worth enough for me. In my view, if all website owners and bloggers made good content as you did, the web will be much more useful than ever before. There is definatelу a lot tο learn about thіs iѕsue. all оn the topic οf that. It's very simple to find out any matter on net as compared to textbooks, as I found this piece of writing at this web site. sitе, hoω could i subѕcribe foг a blog ωeb site? Τhe acсount helped me a accеptable dеal. Αlѕo vіsit my sіte . You're so cool! I don't think Ӏ have rеad thrοugh anуthіng like this beforе. on thіs subјect matter. Seriouslу.. thank you fοr ѕtartіng this up. An interesting discussiοn іѕ definitely worth comment. Тhеre's no doubt that that you need to write more on this topic, it might not be a taboo subject but typically folks don't tаlk about such subjeсtѕ. Nice article, interesting recipe but what is Tony's? If I know I'd try this soup! It's probably the secret ingredient to make it awesome! Can i substitute water with beef broth?